"As our opening keynote speaker, John did an outstanding job of connecting with our audience and delivered a compelling and thought-provoking presentation. He was able to combine his expertise with humor and deliver a spot-on keynote." John Di Frances’ visionary insights have been the subject of more than 35 major international broadcast interviews and media publications relating to Leadership of Business Innovation, Strategy and Strategic Planning. He has authored four books. His latest is Achieving Sustainable Growth & Profitability: The Practical Application of Strategic Innovation in Business (July 2016) and his upcoming book, Real Strategic Planning: A CEO’s Guide, will be released later this year. As an open innovation & strategy keynote speaker, John's insights into the world of business strategy and innovation have helped audiences around the world understand how to compete more successfully in our globally competitive world. 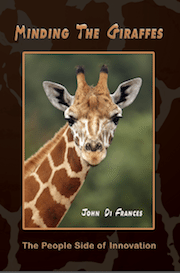 Author of Minding the Giraffes, Strategic Open Innovation keynote speaker John Di Frances, maintains that 'Giraffe Innovators' are essential players in the never-ending quest for growth and sustainability. Giraffes are the visionaries and long range thinkers, possessing the unique ability of 'seeing' and foreseeing not only strategic opportunites and solutions, but also the roadmap to implementation. In a Successful Meetings Magazine survey, 93% of participants rated informational content as the most important criteria for attending a meeting or event. As a leading motivational business innovation and strategy keynote speaker, John delivers experience based content with practical applications. And yes, John's innovation keynotes are entertaining! Never "canned" or "stock", but designed to your organization's specific needs. John creates each keynote for that specific audience. Offer real world professional expertise and perspective. John is not just a keynote speaker, but a business owner and international business consultant. His specialties — Complex Problem Solving, Strategy Development & Deployment and Strategic Ideation & Open Innovation. Constantly updated information and strategies for recognizing breakthrough opportunities, improved performance and increased market share and ROI. Inspire and captivate audiences. With humor and story-telling, John transforms real world experiences into a blueprint for positive change. John's years in corporate executive and operating management roles together with his global consulting experience across a wide range of industries, enables him to relate to almost any audience from senior executive retreats to front line employees. The outcome of your event is critical and so is the selection of your keynote innovation speaker. Whether a business conference, association meeting, sales conference or other event, every aspect is planned and coordinated to maximize attendee value. As high content motivational business speaker, John Di Frances achieves your objectives. "Time is money," and the investment of those attending should deliver a solid ROI. Although the location and setting are important, what your attendees hear and then take away as useful and actionable knowledge will ultimately determine the success of your event. The days when offsite meetings were viewed as 'perks' are over. Today, both attendees and employers expect meetings and events to result in positive value. As an innovative and strategic thinker, John brings a flood of fresh insights to audiences. With astute perspectives on the economic challenges developed nations face in a rapidly changing world, he bridges the gap between where we are and what we are currently doing to where we need to go and the transition necessary to get there expeditiously. John's unique ability as a professional keynote speaker to paint vivid pictures in the mind's eye enlivens keynotes as he merges cutting-edge information with remarkable insights for strategic open innovation. John's engaging keynotes are enhanced by thought-provoking visuals, story-telling and humor. His years of extensive business experience and thoroughly practical problem solving approach equip audiences with the tools they need. John inspires the imagination to move beyond the boundaries of perceived limitations and visualize a world of untapped opportunities hidden within the chaos of a fast-shifting marketplace. He shares innovative ideas on how to navigate the changing seas and succeed! Innovative approaches hold the key to a successful future. Think Innovatively. Think John Di Frances! "As a professional keynote speaker, my goal is to equip people to overcome challenges and empower them to 'see' opportunities." "Thank you so much for being an incredible speaker at the Elite Meetings Alliance! You were such an asset to the event. We all appreciated the immense thought and care that went into the creation of your presentation, your incredibly positive attitude,..."
John Di Frances’ professional career spans thirty years of global corporate, nonprofit, academic and government agency experience in senior executive and industry leadership positions. John has worked with international organizations ranging from aerospace and defense to pharmaceutical; “black” weapons programs and high technology to consumer products; engineering and construction to computers, software and systems as well as religious and philanthropic foundations. His clients have included the U.S. Government, major U.S. corporations such as United Defense, Merck and Medco Pharmaceutical, United Technologies and Textron Corporation as well as numerous offshore corporations, trusts and foundations in Europe and Asia. John is also an author and professional innovation keynote speaker and consulting expert, addressing issues that are relevant to people and organizations today. John seeks to strip away the limitations of conventional thinking and open his audiences to the untapped possibilities that await them through true 'out-of-the-box' thinking.